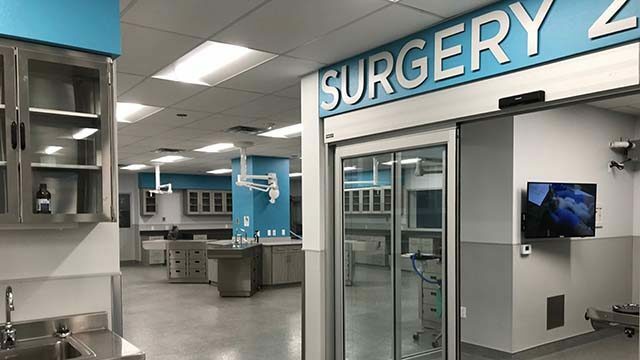 The San Diego Humane Society Tuesday marked the grand opening of its shelter medicine facility, which will be used to care for animals and train future veterinarians. The Pilar and Chuck Bahde Center for Shelter Medicine will help the Humane Society care for the roughly 40,000 animals it serves each year throughout San Diego County. On July 1, the organization expanded services to Carlsbad, Del Mar, Encinitas, Santee and Solana Beach. According to the Humane Society, the facility is the first of its kind in California and includes two surgical suites and a dental suite. The city of San Diego also proclaimed it Pet Wellness Day at the ceremony, where Weitzman was joined by city representatives, Humane Society department directors and Assemblyman Todd Gloria, D-San Diego. “I think every San Diegan takes pride in the fact that we have a progressive Humane Society here that treats animals with incredible respect in a beautiful environment, made better now because of this investment by the Bahde family that really makes sure that the animals here are not just sheltered but extremely well cared-for,” Gloria said.